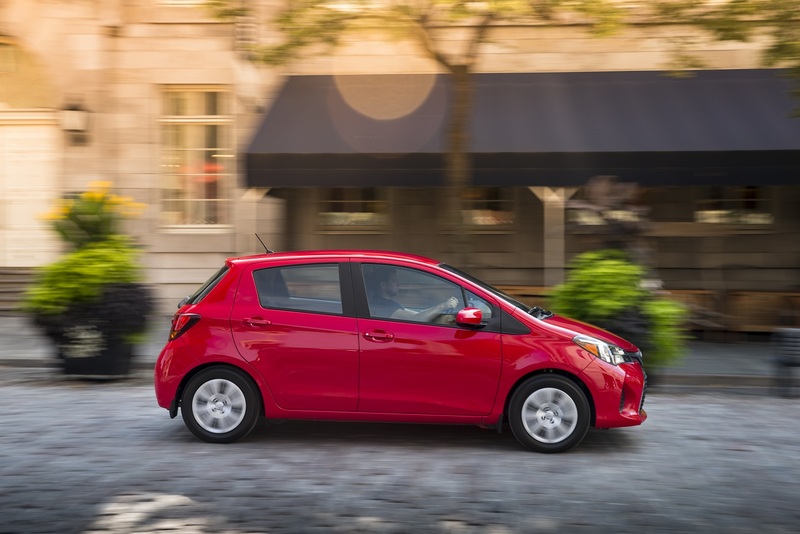 (TORONTO, ON – November 18, 2016) Don’t let its small footprint fool you: The Toyota Yaris Hatchback is big on everything that matters. And for 2017, Toyota offers three models – each in a choice of manual and automatic transmissions – all with new safety and convenience features. Every Yaris Hatchback offers room for up to five people, plus generous comfort, convenience, technology and safety features as standard. For 2017, all models are enhanced with Toyota Safety Sense C (TSS-C) – including a Pre-Collision System, Lane Departure Alert and Automatic High Beams. 2017 enhancements also include a new steering wheel which puts Lane Departure Alert controls and audio controls at the driver’s fingertips. 2017 Yaris 3-Door Hatchback CE (Starting MSRP: $15,395), including a new tachometer for 2017. All models are powered by a 106 peak horsepower, 1.5L 4-cylinder engine and are offered with a choice of a 5-speed manual transmission or an available 4-speed automatic transmission. A fun ride is assured with a Euro-tuned suspension, responsive steering and braking, and a tight turning circle which means even busy city streets are no match for the Yaris Hatchback. All models are impressively equipped, with standard features including Display Audio with Bluetooth capability, power windows and door locks, 60/40 split fold down rear seats, a multi-information display, a rear window wiper/washer, and more. For complete and up-to-date details and specifications on the 2017 Toyota Yaris Hatchback, visit www.toyota.ca/yarishatchback. To learn more about Toyota Safety Sense, visit www.toyota.ca/toyota-safety-sense/en.